The Grand Canyon is not only one of the 7 Natural Wonders of the World, but it is also one of the most popular tourist destinations in the United States with over 5 million visits per year. The Grand Canyon was also named the 17th National Park in 1919 by President Woodrow Wilson, making it one of the oldest national parks in the country. If any, or all, of these fun Grand Canyon facts have you ready to pack your bags, then I say start planning your visit now. Here are some tips on how to plan an epic Grand Canyon Trip that you won’t ever forget. Bring your camera. Okay, I would normally suggest simply enjoying the beauty of this place and not worrying about your electronics and gadgets, but let’s get real. This is one of the most beautiful places you will ever see in your lifetime. Sure, you can do an internet search and see thousands of photos of it, but you are going to want to have your own photos of this place that you so enjoyed. Don’t go in Summer. It is wickedly hot at the Grand Canyon during the Summer months (June, July, and August), you will enjoy yourself much more if you are able to visit from March through May or September through November. In addition to the better temperatures, you will also find far fewer crowds during this off season. Plan enough time. There are different parts of the Grand Canyon that should go to depending on how much time you have to visit. Hike it. Okay, I’m not suggesting you plan for an entire hike of the canyon, but there are some amazing shorter hikes that you can take that will be amazing for really experiencing the canyon and all of its beauty. The Kaibab Trail to Cedar Ridge is just 3 miles roundtrip and is on the easier side for hikers with less experience or for those with children. Embrace learning. Even if you don’t generally enjoy learning about history and geology, I highly recommend taking one of the natural history tours that are led by the forest rangers. During these programs you will learn a variety of things including the history of the canyon and all of its many rock layers. These programs are often done via short, interpretive hikes and are really quite interesting. A good sun hat or visor - Protect your face from the harmful sunrays with a sun visor or hat. 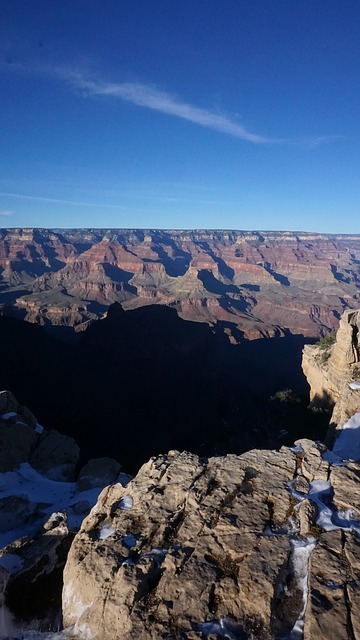 8x21 Small Compact Lightweight Binoculars - The Grand Canyon is an amazing place to view nature at it's finest. Binoculars will help you to make sure you won't miss any of it. Rain Jacket - I know, I know, it's the desert, it doesn't rain. Truth is, it rains much more often than you think. Waterproof pouch - Keep your phone and other necessities dry in case of rain. Hiking Shoes - Comfortable shoes are necessary if you are planning to do any hiking. Blister pack - A nasty blister can ruin your trip. A blister pack can help keep you comfortable. Hiking backpack - If you are planning on hiking, be sure that you have a pack to carry your gear. Sunscreen - The Arizona sun gets hot! Protect your skin. Bug spray - Bug spray is always good to keep on hand when you are outdoors. Chapstick - Chapped lips are another downfall to the sun and heat. First aid kit - It's good to be prepared in case of emergency. Insect Sting Kit - You never know when a bug will strike. Be prepared. Emergency blanket - I'm a big believer in being prepared. Emergency blankets can fit in your pocket, but can save your life in an emergency. Warm Clothes - In case you are still out when the sun goes down, you will notice a significant change in temperature, be sure to bring warm clothes to keep you warm. Thick socks - Thick socks can keep you from blistering when you are on a hike. Water bottles - Stay hydrated while hiking in the heat! Flashlight - Keep a flashlight with you in case you get caught in the dark. Blacklight Flashlight - Scorpions are one of the things you need to keep an eye out for, especially if you are planning to stay over night (scorpions tend to hide out during the day and come out at night). Strangely enough a blacklight flashlight helps you see scorpions in the dark. Granola/Protein bars - Whenever you do any kind of hiking it is important to keep food with you in case of emergency. But always make sure it is sealed to protect you from animals smelling it. Whistle - A whistle is a great communication tool in the event of an emergency.